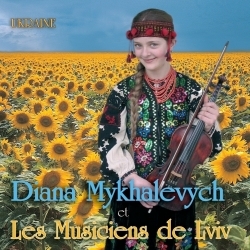 This CD is a mix of classic and folk music with new interpretation of the most famous classical masterpieces, and fiery folk music. Diana Mykhalevych, as an heir to the dynasty of Ukrainian violinists, brings the new sound of her youth into the great traditional Slavic violin and still manages to keep with the recognizable and special sound of the Eastern Europe folk. The past and the future are preserved in Diana's touch. After payment you will receive an e-mail with a link to download the archive file with music in .mp3 and .wav formats, and cover graphic files in .pdf and .jpg formats. File size 860 MB. Estimated download time of 8 minutes.